Hello Friends! Happy Saturday to ya! I'm a day behind in my posts. Friday was a bear and I just could not get to the computer. So, here I am today and if all goes according to plan you just might get a 2fer! Let me show you what I worked on for Day 24. I wanted to do a little watercoloring with my Kuretake Ganasai Tambi set. LOVE these paints! They are so creamy and dreamy to work with. 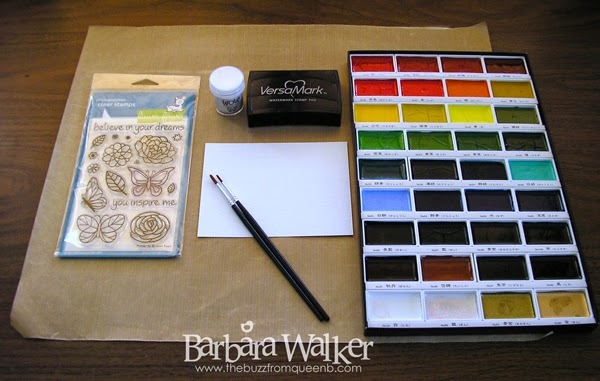 And I wanted to use the Flutter By stamp set from Lawn Fawn. I stamped the images with Versamark ink and sprinkled on Hero Arts White embossing powder and heat set it. I let it cool while I selected the paint pans I wanted to use. That's another great thing about this paint set; the pans are removable from the giant box. 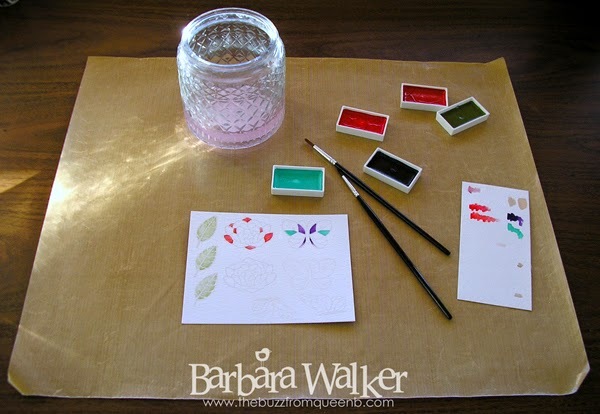 I stamped out the leaves, the lotus blossom and the butterflies. I had no intention of making a card when I did this. I was just planning to watercolor and call it a day. But, I colored one of the lotus blossoms and the colors reminded me of a patterned paper pad that I have in my stash and then I thought, what the heck! So I made a card. After the images had dried, I fussy cut them out. This stamp set has coordinating dies, but I don't own them. The images were really easy to hand cut, so I was fine without them. I embossed a piece of white card stock with a Stampin' Up! 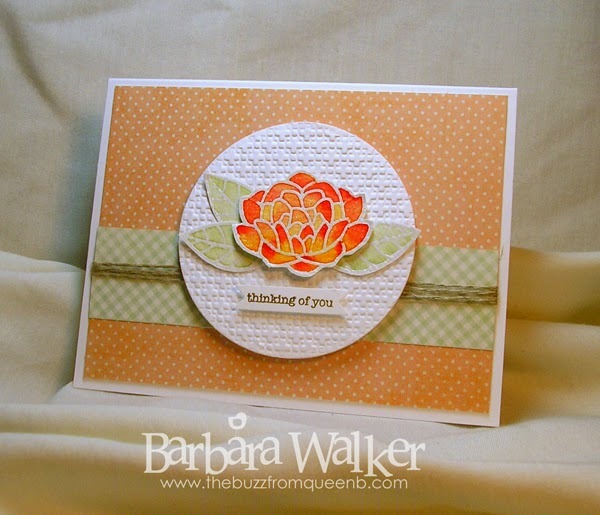 Square Lattice embossing folder to add interest and texture. Then, I die cut that with a Circle Nestie and adhered it onto my card base. I used dimensional adhesive to adhere the blossom and leaves onto the circle. I embossed the greeting with Metallic Gold Rich Regular embossing powder by WOW and die cut it with a Stampin' Up! Bitty Banners Framelit. I adhered that to the focal with dimensional adhesive, gave the blossom the once over with a clear Wink of Stella glitter brush and my card was finished! I didn't even go back and finish the rest of the images. Mmmm...maybe I will later. But, that's it for now. Thank you for visiting me today. I hope you're enjoying your Saturday afternoon. Hi Barb! Sounds like you are one very busy lady, but I for one, appreciate your "catching us up" on your color challenge posts. :) What a pretty card. Boy, you have lots of color mediums at your disposal. Lucky duck! I've heard those watercolors you use are pretty special. You used them well. :) The colors in the blossom are so pretty and the resulting card is lovely. Thanks so much for sharing!